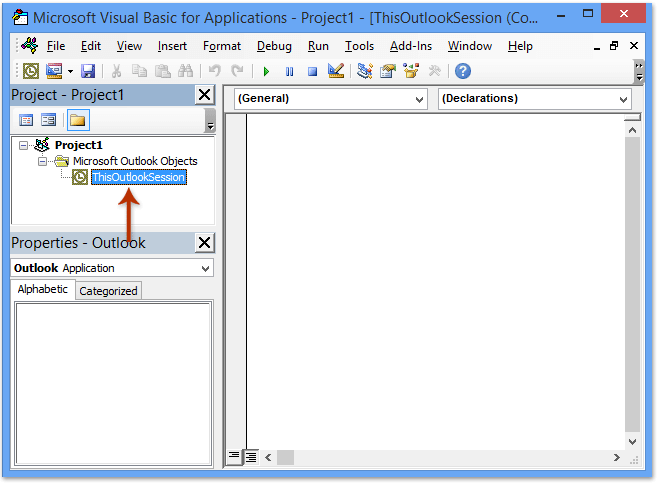 როგორ ავტომატურად გააგზავნეთ ელ.ფოსტით Outlook- ში? დაწერილი 28 მარტს 2013 .
ელ-ფოსტის გაგზავნა და მუდმივი საიდუმლო მიმღები გაქვთ, მაგრამ არ გინდა სხვა მიმღებები მისი მისამართით, თქვენ უნდა გამოიყენოთ Bcc ფუნქცია. მაგრამ როდესაც ჩვენ გვჭირდება bcc, ჩვენ უნდა ხელით დავანახოთ bcc სფეროში და აირჩიეთ საკონტაქტო მას. ამ სახელმძღვანელო ოპერაციების თავიდან აცილების მიზნით, შემდეგი სტატია გაჩვენებთ, თუ როგორ უნდა მოახდინოთ ცვლილებების ავტომატური ცვლილება ელფოსტის მისამართზე გაგზავნის ყველა ელ. გათვალისწინებული Kutools ამისთვის Outlook, ავტო CC / BCC ფუნქცია. დაწკაპეთ 60 დღიანი უფასო საცდელი შეზღუდვის გარეშე! 1. პრესა Alt + F11 გასაღებები ერთდროულად გახსნას Microsoft Visual Basic for Applications window. 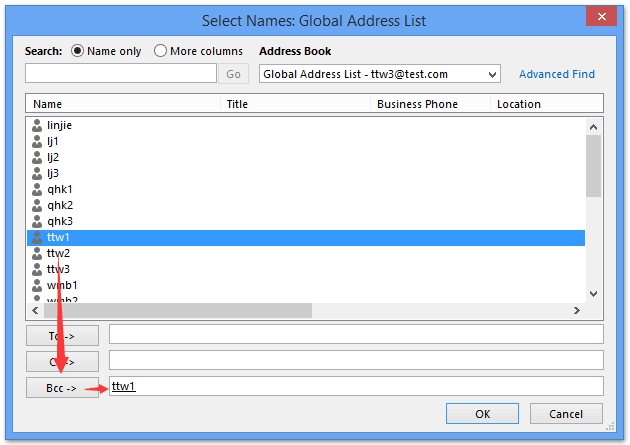 შენიშვნა: გთხოვთ შეცვალოთ "SomeEmailAddress@domain.com" ზემოთ კოდში ელ-ფოსტის მისამართით. 3. შეინახეთ VBA კოდი და დახურეთ Microsoft Visual Basic for Applications window. ამიერიდან, თქვენ არ უნდა შეავსოთ მისამართი Bcc სფეროში. თქვენი მსოფლმხედველობის ელ-ფოსტის გაგზავნისას ავტომატურად მოგიწევთ თქვენი სასურველი მიმღები როგორც VBA- ს კოდი. ზემოთ მოყვანილი VBA კოდი რთულია და პრობლემურია ჩვენს დამწყებთათვის, აქ არის მარტივი და სწრაფი ინსტრუმენტი-Kutools ამისთვის Outlook დაგეხმაროთ ავტომატურად Bcc ყველა ელ ან მითითებულ წერილებს, რომ თქვენ გაგზავნით Outlook. ჯერჯერობით BCC წესი შეიქმნა, როდესაც ელ.ფოსტის გაგზავნისას, იგივე შეტყობინება გამოგიგზავნით bcc მიმღებს ამავე დროს და ეს წესი გამოიყენება თქვენს ანგარიშში არსებული ნებისმიერი ანგარიშისთვის. (1) ამ ფუნქციასთან ერთად შეგიძლიათ დააყენოთ ყოველთვის CC წესებიც. (2) თქვენ შეგიძლიათ შექმნათ მრავალჯერადი წესები როგორც თქვენი საჭიროება გამოყენებით ამ ინსტრუმენტს. (3) თუ გსურთ დახუროთ წესები, შეგიძლიათ დააწკაპუნოთ ავტო CC / BCC- ის ჩართვადა ყველა წესი არ იმუშავებს. ასევე შეგიძლიათ წაშალოთ წესების სახელი ავტო CC / BCC მენეჯერი დიალოგური ფანჯარა გამორთოთ ზოგიერთი განსაზღვრული წესები. როგორ ავტომატურად cc მე ყოველთვის Outlook? 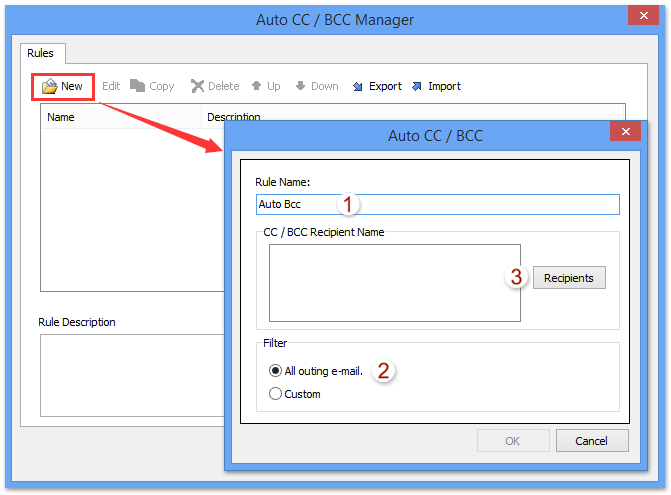 but my question is how can i use this auto BCC for multiple email, here you showed for only one email bcc, can i use this for multiple mail ?? if i can than how ? Hi there and thank you for the code. 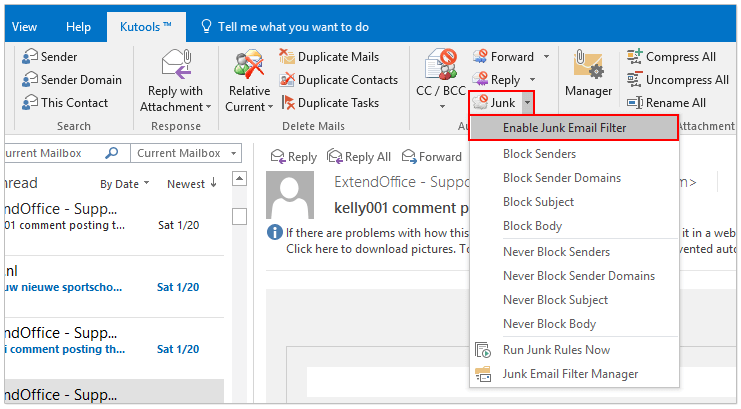 Works perfectly for me in Outlook 2013. I was wondering if there is a way to have it also work when replying to other people's mails. It seems to only work when I send a 'new' mail to someone? The autobcc works like a treat. Hi There, I cannot get the code to work in Office2013. From the tools>>references menu do I need to activate any specific libraries? 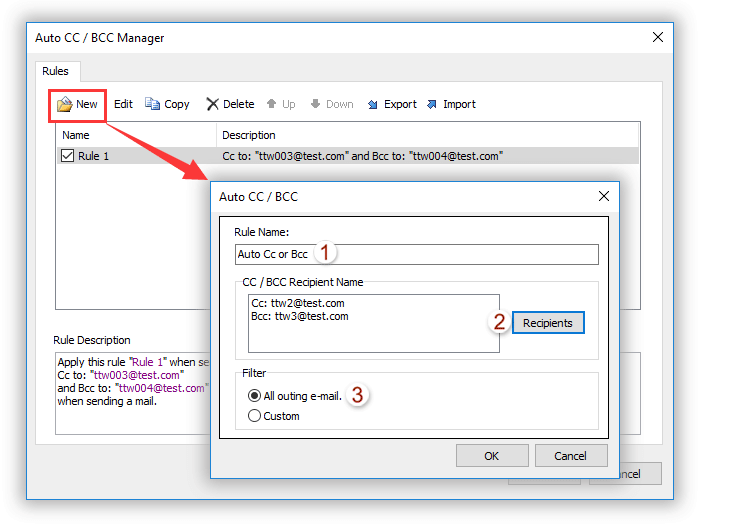 Great post - really helped, the only problem is the bcc doesn't run when the mail isn't created from within Outlook - eg you right-click on a file from the desktop, send to, mailrecipient, or you click on the email file icon from within a program, and it doesn't bcc - can anyone help ? 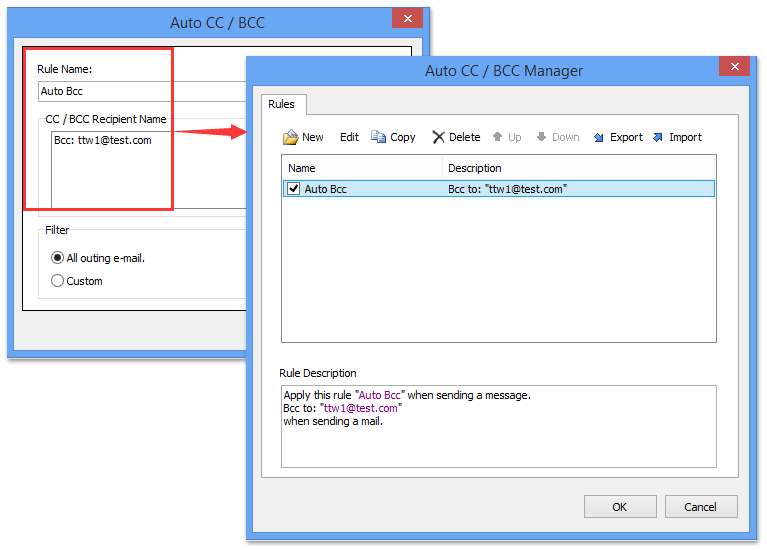 I also slightly modified the code, so that Outlook gives you choice whether or not to bcc the recipient.